A message transfer part is a functional process that is used in a common channel signaling system, which transfers control signaling messages as required by users. The message transfer part also contains error control and signaling security processes. This figure displays that message transfer is devided into three parts in the SS7 system. Level 1 part is responsible for the physical transport of information on the signaling links that connect SS7 components. Level 2 part is responsible for message transfer on specific links. 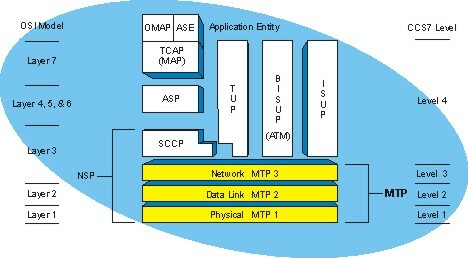 Level 3 part is responsible for ensuring messages are transferred through the network.